State public health officials are warning consumers not to eat fresh ginger from China after inspectors found residues of an illegal insecticide in boxes of the root at an Albertsons grocery store in Roseville. The chemical, aldicarb sulfoxide, was found on the ginger at concentrations high enough to make a consumer sick, said Glenn Brank, a spokesman for the state Department of Pesticide Regulation. "This is not a life-threatening concentration, but it is illegal, and it is at a level where it could make somebody ill," he said. No illnesses from the chemical have been reported, according to the state Department of Public Health. Aldicarb sulfoxide is a potent neurotoxin. At high concentrations, it can cause nausea or dizziness. However, it is not carcinogenic. "Its effects tend to be reversible and short-lived," said Karl Tupper, a staff scientist at Pesticide Action Network North America, an advocacy group based in San Francisco. Aldicarb sulfoxide is what's known as a "breakdown product" of the pesticide aldicarb, which means that it is what's left over after aldicarb begins to degrade in the environment. Aldicarb is used to kill aphids, mites and certain flies, as well as flatworms in the soil. It is approved for use on several crops grown in California, including cotton, some types of beans and pecans. In California, cotton farmers are the biggest users: They applied 99.5 percent of the 228,761 pounds of aldicarb sprayed in the state in 2005, according to state records. Aldicarb is not approved for use on ginger in California, so any presence of the chemical or its byproducts is illegal, Brank said. State inspectors found aldicarb sulfoxide during a routine survey. The contaminated ginger is known to have been distributed to 24 Albertsons stores in Northern California, and may have been on store shelves as early as July 10. Modesto-Based Save Mart Supermarkets, which owns the Albertsons stores in Northern California, pulled all ginger from those locations beginning last Friday, said spokeswoman Alicia Rockwell. As a precautionary measure, the company also pulled ginger from its Save Mart, S-Mart foods, Food Maxx and Lucky stores, although those stores are not believed to have received the contaminated product. The company is attempting to purchase ginger from Brazil, Rockwell said. Customers can return ginger purchased between July 10 and July 26 for a refund, she said. The contaminated ginger was shipped to the Albertsons stores from Christopher Ranch LLC, a Gilroy company better known for its California-grown garlic. Bill Christopher, the managing member of the company, said he purchased the ginger from Modern Trading Inc., a Southern California import firm, which had imported it from a Chinese firm. Christopher Ranch sells ginger grown on its own farms in Hawaii from November through April, but began importing from China to meet its customers' year-round demands, Christopher said. The company will not sell Chinese ginger in the future, he said. An employee at Modern Trading declined to comment. The company's owner was not available Monday. The state Department of Public Health and the U.S. Food and Drug Administration are attempting to trace the ginger sold by Modern Trading to other parts of the country. State pesticide inspectors do roughly 3,700 tests of produce in stores annually, and find violations in just under 2 percent of samples, said Brank, the state pesticide spokesman. Most, however, are significantly less serious than the current case. "It's pretty rare that we actually get a sample that has an illegal pesticide on it," he said. Duxelles is a finely chopped mixture of mushrooms, onions, shallots and herbs sautéed in butter. It is a basic preparation used in stuffings and sauces (notably, Beef Wellington). It is said to have been created by the 17th-century French chef François Pierre La Varenne (1615–1678) and to have been named after his employer, Nicolas Chalon du Blé, marquis d'Uxelles, maréchal de France. Galette is also the name given in most French crêperies to savoury buckwheat crêpes, while those made from wheat flour, mostly served with a sweet filling, are simply branded “crêpes.” Crêpe is a type of thin pancake mostly associated with the region of Brittany where it replaced at times bread as basic food, but it is eaten as a dessert countrywide. Buckwheat was introduced as a crop suitable to impoverished soils, so aside from Britanny, buckwheat crêpes were known to other regions where this crop was cultivated, such as Limousin or Auvergne. Unlike the crêpe, it is sometimes cooked on one side only. The galette is frequently garnished with egg, apple slices, meat, fish, cheese, salad or similar ingredients. One of the most popular varieties is a galette covered with grated gruyère cheese, a slice of ham and an egg, cooked on the galette. In France, this is known as a galette complète (a complete galette). A hot sausage wrapped in a galette (called a galette-saucisse, a tradition of Rennes, France) and eaten like a hot dog is becoming increasingly popular as well. Established in the San Francisco area in 1929, this chain operated at least as far south as Fresno and as far north as Fort Bragg, although most of its stores were along the coast, many of them in small towns. The owners, the Niven family, liquidated the chain in 1972 and now operate a Nothern California winery. 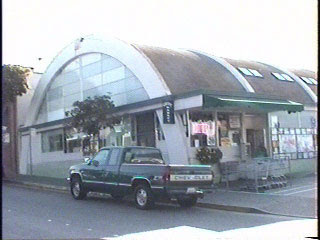 The Fort Bragg location was still operating as the last remaining Purity store, with original signage in place, as late as 2003. SAN FRANCISCO—Family-owned businesses account for more than 90 percent of U.S. businesses, responsible for half of the country's gross domestic product and about three-quarters of America's new jobs.1 Most of California's 2,000 wineries are also owned by families. They are a major economic engine in the state that has an economic impact of $45.4 billion on California's economy. A unique feature about California's wine families is that the family name is often on the wine label. This usually means that the family will choose the path to quality in business or production decisions because its family name, and thus its reputation, is at stake. Family members tend to be loyal and dedicated to the family enterprise and the family presence in winery jobs provides continuity in passing institutional knowledge on to others at the winery. Finally, family members will work to keep the business valuable and reputable so it can be passed on to their children. California's wine families become versed in all aspects of the wine business, learning grapegrowing, winemaking, marketing and hospitality in the tasting room and events. Throughout California, wine lovers can meet the interesting personalities behind their favorite wines. The following is a brief sketch of some of the wine families from Sonoma, Santa Cruz, San Luis Obispo, Paso Robles, Monterey, Lodi and Amador wine regions. Sonoma County has an unparalleled wine history, with the first grapes planted in 1812 at Fort Ross on the Sonoma Coast, and California's oldest premium winery, Buena Vista, founded in 1857. With Sonoma's combination of history, heritage, and new winemakers, the county is home to many dynamic multi-generational family wineries. Included among these are Foppiano Vineyards, founded in 1896. It is still family-owned, with fourth-generation winegrower Louis Foppiano continuing the family tradition of distinctive and robust Petite Sirahs. Gallo is one of the most recognizable names in the wine world, yet Gallo Family Vineyards is still family-owned and is at the forefront of the sustainable agriculture movement. Under the guidance of third-generation family members Matt Gallo and Gina Gallo, the winery takes pains to plant only half its acreage to grapevines, leaving the other half in its natural state. Another leader in sustainability is Seghesio Family Vineyards, which under fourth-generation winegrower Ted Seghesio, has shifted to producing almost exclusively estate-grown wines. In the Sonoma Valley, Mike and Mary Benziger first discovered the 85-acre Glen Ellen property that would give Benziger Family Winery a home in 1980. Today, two generations involving more than two dozen Benzigers are affiliated with the estate winery. The family's passion is to craft wines with a distinct sense of place that reflects Sonoma Mountain winegrowing. The winemaking heritage at Bargetto's Santa Cruz Winery began with brothers Phillip and John Bargetto who emigrated from Castelnuovo Don Bosco, a small town in the Piedmont region of northern Italy. The Bargetto family winemaking heritage continued with John's son Lawrence during the 1960's and 1970's. He introduced modern technology such as stainless steel fermentation, barrel aging, and added new Santa Cruz Mountains varietals such as Pinot Noir and Chardonnay. The third generation of Bargetto family members now directs the operation of the winery. Founded by Bill and Brenda Murphy in 1992, Clos LaChance in Saratoga has grown from its backyard "roots" into a 60,000 case per year wine business. As the business has grown over the years, the Murphy's have enlisted the help of their two daughters—Cheryl Murphy Durzy and Kristin Murphy. Cheryl manages sales and marketing for Clos LaChance and its subsidiaries. Kristin manages the events portion of the business as well as the vineyard management company CK Vines. Founding winemaker George Cooper of Cooper-Garrod Estate Vineyards in Saratoga planted the first Cabernet Sauvignon in 1972 with his nephew Jan Garrod, thinking of it as a retirement hobby when he would retire from test piloting at NASA/Ames. In the ensuing 22 years, Chardonnay and Cabernet Franc were added on lands farmed by the family since 1893. George took courses at UC Davis and learned from fellow winemakers in the Santa Cruz Mountains and on visits to France. Spring of 1994 heralded the first commercial release for Cooper-Garrod, and in 1996, son Bill completed a career in the Foreign Service to return to the ranch where he grew up and joined his father in winemaking. Although the second generation to join the winemaking effort, Bill and his cousin Jan are first generation in the Cooper-Garrod agricultural heritage. When visiting wineries in San Luis Obispo County, you are bound to meet a family member of the winery who may be harvesting fruit or pouring a glass of wine in the tasting room. The family nature of the business helps create the family feeling throughout the winery. The Niven family is now into its third generation in the industry, growing winegrapes since the 1960s for their Baileyana Winery and Edna Valley Vineyard in San Luis Obispo. The Niven's third generation is taking the business to the next level with a new brand, tangent, which focuses solely on alternative white wines, one of the first brands to do so. To experience another family run and operated winery, stop by Kynsi Winery in Arroyo Grande where Don and Gwen Othman have had their hands in the wine industry for over 25 years. Two daughters run the tasting room which is located in a renovated 1940's dairy. At Ortman Family Vineyards, Dad Chuck Ortman has been making wine for over 20 years in San Luis Obispo County and has recently started winemaking with his son Matt Ortman. They specialize in limited production Pinot Noir, Chardonnay, Syrah and Sangiovese. The entrepreneurial spirit is alive and well in Paso Robles Wine Country as many family-owned and operated businesses prepare for the next generation to lead the business and move the industry forward. From viticulture to winemaking to sales and marketing to operations, the second generation is stepping up in all aspects of the business. Working hand-in-hand with their families, the next generation is already making an impression on the growing Paso Robles wine industry. At J. Lohr Vineyards and Winery, the second generation—Steve, Cynthia and Lawrence—work in vineyard development, sales and marketing. Steve Lohr is spearheading winery expansion both in Paso Robles and in Monterey. At Peachy Canyon, both sons, Josh and Jake are active in winemaking and sales roles. At Steinbeck Vineyards, three generations actively work with the vineyard—father Howie, daughter Cynthia and grandson Ryan. Austin Hope is another example of the second generation leading the winemaking and overseeing all aspects of the business at Treana and Austin Hope wineries. Jason Hass at Tablas Creek serves as General Manager, learning from his father. In all cases the second generation is taking a leadership role in helping Paso Robles achieve its full potential on the national and global front. In Monterey County, the next generations of Wente, Scheid, and Smith families are all carrying on the traditions of their pioneer parents. Wente Vineyards is California's oldest continuously family owned and operated winery. Established in 1883 by C.H. Wente, the fourth and fifth generations of the Wente family are actively involved in vineyard and winery operations. Karl Wente, great-great-grandson of the founder, is the winemaker, and his sister, Christine Wente, is in charge of marketing. Al Scheid had a wonderful vision for the Monterey wine industry when he co-founded Scheid Vineyards in 1972. Today, his children are carrying through on that vision to be one of the largest independent growers of premium wine grapes. Scott Scheid serves as President and CEO and Heidi Scheid is the Senior Vice president. One of their most recent accomplishments is the opening of the new Scheid Vineyards Winery with their father in August 2005. At Paraiso Vineyards, the founding vineyard in the Santa Lucia Highlands appellation, winegrower Rich Smith is working side-by-side with son Jason. "After 40 years of living and working on this 'heavenly' spot, it's gratifying to see my children taking over—Jason is a very talented vineyard manager, committed to the high quality, 'sustainable' Paraiso ideal." Many of Lodi's winegrowing families have been in the area for over 100 years. These families are genuinely rooted in the soil, and have worked to build Lodi's reputation as a premium winegrowing region. Over the last decade these dedicated winegrowers have sparked a remarkable transition, one that has catapulted Lodi into the vinous spotlight. Fifth and sixth generation winegrowers like the Phillips family, the Mettler family and the Lange family are vertically integrating creating their own wine brands and building recognition for Lodi Wine Country as a producer of fine wines. A recent trend in Lodi Wine Country is the returning of the children after college to the family business. A number of families are integrating the next generation into the family business in viticulture, enology and business management positions enhancing the expertise and knowledge of the business and the region. The next generation is a driving force behind a number of local wineries, driven by the desire to highlight the quality wine produced and the culture in the region. Prospering for 30 years in the California wine business is no small feat for a family winery crafting organically grown wines in an off-the-beaten-path wine region. In 1977, Leon and Shirley Sobon brought their six children from the San Francisco Bay Area to Amador County's Shenandoah Valley to establish Shenandoah Vineyards. Twelve years later, the family acquired the historic D'Agostini Winery and renamed it Sobon Estate. Today, the Sobons are widely respected throughout California wine circles for their innovative grape-growing, winemaking and marketing practices. In 1989, they were among the first in California to embrace organic grape growing, and their 160 acres of estate vines are now certified organic. The family also pioneered Rhône grape varieties in the Sierra Foothills, conducted important trials with rootstocks, clones, trellising systems and yeast strains, and were among the first to commission original artwork for their wine labels. Today, Leon and Shirley's children carry on the family tradition. Son Paul is winemaker for both Shenandoah Vineyards and Sobon Estate while his brother Robert oversees customer relations. The Sobon family is intent on making wine in Amador County for many years to come. 1San Francisco State University Business and International Education (BIE) Grant "Family Wineries" Project. Governor Arnold Schwarzenegger has declared September 2006 as California Wine Month, and now is a great time to visit the state's wine regions, as special events and complimentary wine tastings are being offered at many wineries. Visit the California Wine Month web site to learn more about what is happening in California wine country. Retailers, restaurateurs and other significant partners are also supporting California Wine Month 2006. Partners for 2006 include Safeway Stores (which is promoting California wine in 22 states), Cost Plus World Market, Beverages and More, P.F. Chang's China Bistro, Morton's Steakhouses, Tavistock Restaurant Group, Joie de Vivre Hotels, the San Francisco Chronicle, the California Restaurant Association and Culinary Institute of America at Greystone. Greg and Toku Beccio started farming organically in 1988 on two acres under the name of Riverside Farms. emphasis on high quality service, freshness, diversity, and unique specialty items centered around farmers' markets, direct delivery and selected wholesale commodities." Scaling down from the large farm to a new smaller operation made Greg a "happy boy." "Today we farm 125 acres on six separate farms in four separate geographical areas. By being in different microclimates, we are able to grow a large product mix, maintaining a wide range of diversity over an extended period of time. Having a background in business finance has helped with the challenges of operating such a multifaceted operation; however has done little if anything to help us in raising produce. Much of what we learn is through trial and error, usually relying on the expertise of our employees who often have a rich background in agricultural experiences." Happy Boy Farm employs over 50 employees during peak season. Adrian Albor and Renato Campos are two valued employees who are instrumental in the day-to-day operation. "They have an instinct -- they know what we are asking for before we ask for it. I ask them for advice. Any employee that takes an active interest in what we are doing, I let them take the reins." Greg states he pays his employees well and offers free housing on the farm. "Four of my employees have been able to purchase their own homes." Greg states the most difficult problems are the ever-changing demands placed upon a diversified and complex operation. "It has the characteristics of a very large business from a logistical and management perspective, coupled with the constraints of a small company such as budgetary and competitive issues. The amount of stress involved is further exacerbated by working with perishable products. Still the many positive aspects outweigh the negatives. Walking through the fields at sunrise or sunset, harvesting your own fresh gourmet produce, and sharing it with friends, chefs or customers at market is an experience unlike any other. It's hard to imagine the grass could be greener anywhere else." and carrots. Summer crops include over 40 varieties of heirloom tomatoes, ten varieties of specialty melons, Cipollini onions and specialty potatoes. "In tomatoes, look for the degree of ripeness which best suits your needs. We harvest vine ripe so shelf life is about a week at best. Check to see that the calyx (the green star at the top) is green and fresh. That's always a good indicator. Avoid bruised fruit. Melons can be tricky since some varieties have no fragrance or outward appearance of ripeness, while others have that sweet, fruity smell. If you are unsure, ask the salesperson staffing the market. They are knowledgeable and experienced. For salad greens look for freshness by carefully inspecting the mix. It should be dry, fluffy and well balanced, not limp. Yellowing product is old and unsuitable. It's advisable to try to maintain the cold chain (allow the temperature to warm as little as possible). Every effort has been made to bring the product as cold and fresh as possible. Shop early!" Secondary Products- Fall and winter products may include cabbage, kale, turnips, radishes, rapini, collards, mustard greens, napa, bok-choy, dandelion greens, hard squash, leeks, chard, radicchio, frisee, garlic and fennel. "We tend to offer unusual or hard-to-find varieties of these items, when possible." Spring and summer products include five varieties of summer squash, basil, seedless watermelons, specialty eggplant, sweet corn, fresh herbs, sweet and hot bell peppers, and specialty cucumbers. "Always look to see if products look fresh. 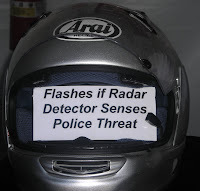 Visual inspection is the key." Editor's Note-This post is best read while listening to King Crimson's Lark Tongues in Aspic. I included the 1972 version of Part 1, with a great version of Part 2 from 1982. Aspic is a dish in which ingredients are set into a gelatine made from a meat stock or consommé. When cooled, stock made from meat congeals because of the natural gelatin found in the meat. The stock can be clarified with egg whites, and then filled and flavored just before the aspic sets. Almost any type of food can be set into aspics. Most common are meat pieces, fruits, or vegetables. Aspics are usually served on cold plates so that the gel will not melt before being eaten. A meat jelly that includes cream is called a chaud-froid. Nearly any type of meat can be used to make the gelatin: pork, beef, veal, chicken, or even fish. The aspic may need additional gelatin in order to set properly. Veal stock provides a great deal of gelatin; in making stock, veal is often included with other meat for that reason. Fish consommés usually have too little natural gelatin, so the fish stock may be double-cooked or supplemented. Since fish gelatin melts at a lower temperature than gelatins of other meats, fish aspic is more delicate and melts more readily in the mouth. Historically meat jellies were made before fruit and vegetable jellies. By the Middle Ages at the latest, cooks had discovered that a thickened meat broth could be made into a jelly and that the jelly could seal cooked meat from the air and therefore keep it from spoiling. A detailed recipe for aspic is found in Le Viandier, written in around 1375. Gelatin is also found in cartilage. Aspic is a dish in which ingredients are set into a gelatine from a meat stock or consume. When cooled, stock made from meat congeals because of the natural gelatin found in the meat's bones, cartilage, and fat. Nearly any type of meat stock can be used to make the gelatin, veal, pork, beef, chicken or fish. 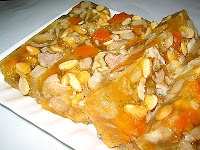 If his customer is interested in making an aspic, he can add either powdered or sheet gelatin to our prepared stock according to the directions on the gelatin. The dish is served cold so the aspic does not melt. Dallas-based Winn Meat Company launched a new Web-cam campaign that will allow consumers to watch premium cuts of beef dry-age online. 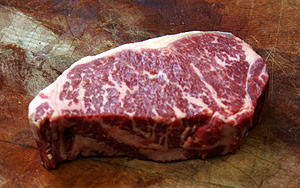 The Web cam, aimed at satisfying a growing consumer need to know where meat originates and how it is produced and seasoned, captures the company's signature dry-age technique with Cargill Meat Solutions' Sterling Silver beef. Winn Meat Co.'s dry-age process, or proteolysis, is a slow breakdown of animal proteins that creates more flavorful beef. To highlight the process, Winn Meat Co. recorded the 21-day experience of "PRIMO the Pampered Steak" and documented it at www.winnmeat.com. "What could possibly be more exciting for our customers than watching proteolysis at work?" said Jamie Samford, corporate chef for Winn Meat Co.
Stockyards Angus beef is s USDA certified Angus beef program. This premium program features only mid-western grain fed cattle, USDA inspected and certified, all in the upper 2/3rd Choice catagory. 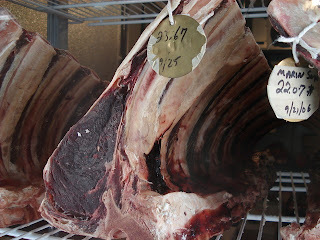 Stockyards Angus beef is aged a minimum of 21-28 days before being released for sale. For More info about Stockyards Angus follow the following link or contact Brian directly. The Duck Club Grill, located inside the Monterey Plaza Hotel & Spa, is one of the country's top 10 hotel restaurants, according to a national survey of travelers that appeared on TravelPost.com. The Monterey restaurant, overseen by chef James Waller, was ranked No. 4, with a special mention for the eatery's wood-roasted Steinbeck's Duck with sweet yam and celery root purée and sauce bigarade with blood orange. Chef Waller began his career in the San Diego area, where he worked for over 11 years at the world-renowned Hotel Del Coronado. He prepared state banquets for Presidents Nixon, Ford, Bush and Clinton and for Henry Kissinger. 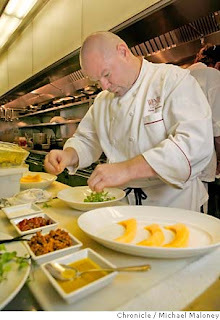 As Executive Chef at the Monterey Plaza Hotel & Spa, he has helped to establish the hotel’s reputation for quality and innovation. He was recognized by the American Academy of Hospitality Sciences through its 5-Star Diamond Award in 1999, 2000, 2001 and 2002. Under Chef Waller's expert direction, since 1997, restaurant and banquet menus are comprised of fresh, contemporary dishes that make innovative use of Monterey's agricultural and aquatic bounty, while harmoniously blending traditional and new styles of cuisine. "The abundance of fresh foods available on the Monterey Peninsula makes it possible to develop menus that are simple, elegant, and exciting," said Waller. 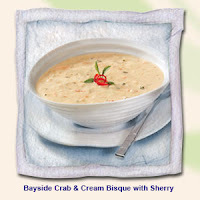 "We've added more fresh seafood selections and more grilled entrees, lightening the menu and enhancing the flavors. After implementing the new menu in The Duck Club, I applied the same concept to our banquet menus and now we have satisfied restaurant diners as well as banquet patrons." For his efforts, Chef Waller has been awarded the Five Star Diamond Chef award for five consecutive years. Others on the list, starting with No. 10, were Hoku's at The Kahala Hotel and Resort in Oahu; Sazerac at Hotel Monaco Seattle; The Restaurant at Hotel Bel Air in Los Angeles; Wright's at the Arizona Biltmore Resort and Spa in Phoenix; The Dining Room at The Ritz Carlton San Francisco; Eau Bistro at Chase Park Plaza Hotel in St. Louis, Mo. ; Blue Fin at W. Times Square, New York; Victoria & Albert's at Disney's Grand Floridian Resort and Spa in Lake Buena Vista, Fla.; and Bouchon at The Venetian Resort Hotel Casino in Las Vegas. The San Mateo-based online travel site features hotel ratings and reviews from users. For information or to contact The Duck Club, call 646-1706. On Friday July 20th PFN was on hand for a behind the scenes look at the new BBQ menu at Sticks Restaurant at the Inn at Spanish Bay, Pebble Beach. Sticks is also know as the 19th hole, for fun food And sports. 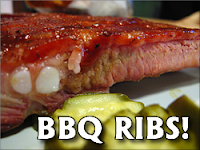 The menu features bbq ribs, pastrami sandwiches, burgers, fire broiled salmon and more. Now through July and August just follow the smoke as Chef Ted Consoli fires up the wood grilled bbq on the back porch. 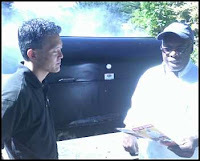 We were in time to find Gil Takemori of Western Freezers Specialty Equipment trying to size Chef Perry up for a Bar-B-Q Boss(R)Pressure Smoker. Meat is seasoned with The Boss's special one step prep and placed on rack top is clamped in place and timer set. No skilled labor is needed. The Boss needs no attention during cooking cycle. Delicious tender 'n juicy barbeque is removed from the cooker. The Pressure smoker has been used in kitchens at the Outback Steakhouse chain among others to take a smoking operation that used to take 16 hours down to just a an hour or two. There is no plumbing required, it is fully automatic, and normally does not require any venting or hood. Next Bill Cox of Lad Foodservice stepped into the smoke to offer up some new asian items from Pacific Jade. You have seen Pacific Jade before as we reviewed thier Gourmet Egg Rolls (see Dial-A-Special or Fantastic Products Label for a review). 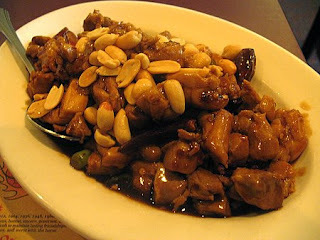 Today Bill had two of their newest additions General Tsao Chicken and Sauce Kit, and Orange Chicken and Sauce Kit. Both cooked and flash frozen entrees come packed in a 12lb box. The battered and fried chicken chunks can be ovened or fried and served with the premade sauce packets that are enclosed for a quick simple authentic meal. Battered and fried dark meat chicken nuggets with a ginger, garlic, sesame oil, scallion and hot chili pepper sauce. Battered and fried, chopped chicken nuggets with a spicy and sweet orange-flavored chili sauce. I Could Have Used One Of These For The 12th Street Marina Exit on Highway 1. Laguna Seca and over half a billion (yes, that's billion with a "b") have watched the MotoGP World Championship Race during the last two Red Bull U.S. Grand Prix events. For Some Reason Every time Clayton Passed a Pretty Girl He Said "Outta Your League Dad, Outta Your League." don't expect Valentino Rossi, Dani Pedrosa and Americans Colin Edwards, John Hopkins and Kenny Roberts, Jr. to go quietly the third time around. Defending Series Champion Ben Spies leads Eric Bostrom, Miguel Duhamel, Mat Mladin and the rest of the AMA Superbike contingent for their first of two visits to Mazda Raceway Laguna Seca. The 600cc race bikes of the AMA Supersport class also will participate during the Red Bull U.S. Grand Prix. 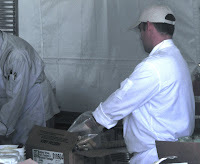 Peninsula Foodnews was on hand to review the local food scene that was a part of the event. were on location at the crack of dawn each day prepping for the food service at the Pit Row suites VIP area. After we finished our service we switched from vendors to spectators. Our first stop? The food court of course! Chef Dory Post was on hand with Bon Appetite at the Monterey Bay Aquarium. stations were staggered throughout the event for spectators to use. 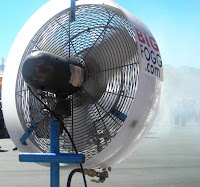 At one point Clayton and I camped behind a Big Fog fan..conveniently located just out side of the Silverstone Tavern(English Ales). Clayton found a home at the Blanco Basura tent. With his single purchase this day we completely ruled out our trip to the spoken word Poetry Slam in Big Sur. 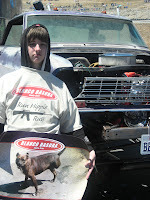 2005 6th place in California state championship BBQ for Tri Tip. 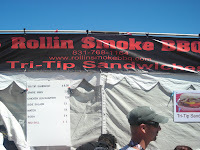 You will find the Rollin' Smoke BBQ crew vending fresh and delicious BBQ at various events throughout California. They have been found at events everywhere from the California International Airshow to art & wine festivals, car shows and fundraisers. Volunteers are the background of events like these. Explorer scouts, school community service groups, Boy Scouts, and others fill hundreds of jobs to assist in this event. 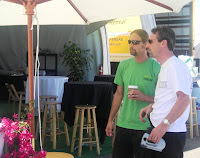 One volunteer, Thresher Rolle of Pacific Grove is a purchasing agent at the Santa Lucia Preserve by day, but manned buses and booths to ensure the weekend was a success. 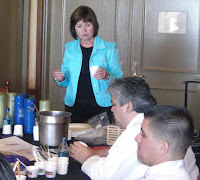 I was pleased to have the opportunity to spend time with Maureen Hague of Campbells soup recently as she presented some new products from Campbells to Chef's here on the Central Coast. Our trip on a recent Friday was the second together, and this one was specifically focused on two product lines in the Campbell's portfolio. 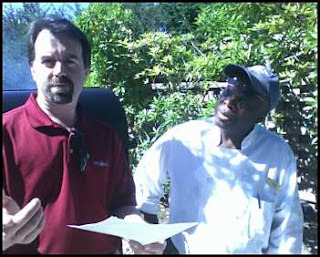 At one resort property with Maureen presenting, and me scooping and serving, we had 6 Chef's and one Administrative Assistant on hand tasting and providing feedback. Each product is packed 3- 4lb trays per case. 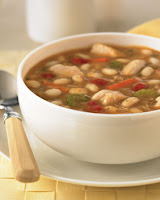 Cost per ounce of any of the Well and Good Soups averaged around 12 cents per ounce. We found this product to be packed 4-4lb boil in the bag pouches per case. Each of the 9 flavors had distinctive highlights, while the Red Pepper and Smoked Gouda Bisgue was the definate favorite both as a soup or as a sauce or a garnish for other dishes. Costs of these high quality soups were in the 25 cents per ounce range. Just a quick note to let you know that we lost a load of cheese today due to a truck fire in Sacramento. This was not a US Foodservice truck , but an outside carrier. Thankfully no one was hurt. Great Lakes ( Lynda Knudsen ) , we should not see any major outs. SACRAMENTO COUNTY, Calif. -- Traffic backed up along Interstate 80 early Thursday after a big rig loaded with provolone, cheddar and other cheeses caught on fire. The truck ignited along the freeway at Watt Avenue at about 3:45 a.m., the California Highway Patrol said. Frank Barker, who was driving the rig from Salt Lake City to the Bay Area, said the trouble began when smoke began pouring out from under the truck. Barker said he pulled the rig over and at that point the fire erupted. He tried to use a fire extinguisher to douse the blaze, but to no avail. "It went pretty quick," said Barker, adding that he was "stunned" by the fire. "At this point, I just don't know what I'm going to do or where I'm going to go," he added. Amid the chaos, Barker said he jumped back into the tractor and rescued his dog, who accompanies him on long hauls. Barker and his dog were not injured. As of sunrise, firefighters were still at the scene. Cheese packages were scattered along the side of the road and the cleanup was expected to take several hours. Iceless means no mess, longer shelf-life, less cooler space, and a more stingent food safety program. For a complete list of specs please call Brian. In a large skillet, heat the olive oil over medium heat. Cook the red peppers, onion, and garlic until soft, adding small amounts of water to keep the skillet from drying out and stirring from time to time, about 30 minutes. Meanwhile, bring a saucepan of water to a boil, salt lightly, and cook broccoli stems for a few minutes, then add florets. Cook broccoli until tender but still bright green, no more than about 10 minutes. Drain, break up slightly with a fork, and toss with the red bell pepper mixture. Season with salt and pepper, top with grated cheese, if desired, and serve immediately. Christina Seid, whose family have been making ice-cream at the Chinatown Ice Cream Factory for 28 years, said yesterday that she expected to have to raise her prices, along with all competitors in the short term. “We are holding out as long as we can, but prices will rise,” Ms Seid said. Amy Green’s Ivanna Cone ice-cream emporium in Lincoln, Nebraska, has already raised its prices for a small cone to $3.50 before tax, up from $2.95 a few months ago. She also estimates that she is paying $150 more a week for the butterfat that she uses in her ice-cream. The squeeze on ice-cream makers, chocolate manufacturers and pizza companies – all of whom use dairy produce as a raw material – is set to tighten as the price of a gallon of milk in the US – up 55 per cent in the past 12 months in some American states – is now the same as a gallon of petrol, with dairy prices accelerating faster than the cost of fuel. Prices for dairy products have also risen because of increasing demand from China and the Middle East along with the drought in Australia, reduced subsidies in the European Union and the rocketing cost of corn. Coast with the rare diamonds of Italy & France. Douglas Keane of Cyrus, Healdsburg. in a lifetime culinary experience. At Central Coast College, the aim is to get students ready to work. Less theory, more real-world applications. That is why the Salinas vocational school is looking to the real world to launch its next program. This fall, the 24-year-old college is adding a hospitality and tourism program, tapping into a need to help hospitality employees move up through the ranks. The program can serve those considering hospitality careers, said Sara Benevento, community relations representative for the school, but is particularly suited for working professionals who want to transform a job into a career. Whether they work as restaurant hostesses or hotel clerks, hospitality employees at some point may want to advance to more regular hours, greater responsibility and better pay. High industry turnover can make it a challenge for lodgings, restaurants and others in the hospitality trade to maintain standards. Ongoing training — through specific management courses, for example — helps companies promote employees to supervisory roles from within, she said. Bert Cutino, co-founder and chief operating officer of the Sardine Factory restaurant, says there's a need for more hospitality training programs. Hiring trained staff is one of the biggest challenges restaurants and others in the hospitality industry face, said Cutino. That was so when the Sardine Factory opened almost 40 years ago, and it holds true today. Cutino supports multiple scholarship programs through culinary professional organizations and is a frequent guest and speaker at culinary schools. The more access there is to professional development, he said, the better for the Peninsula's main industry. "The hospitality industry is so vital to this area," said Cutino. "We have enough demand that whatever they kick out, we can use." Monterey Peninsula College and CSU-Monterey Bay offer hospitality programs. At MPC, students can earn a certificate or associate degree in hospitality operations or an associate degree in restaurant management. CSUMB offers hospitality concentrations in hotel/resort management and general hospitality management through its School of Business. Central Coast College President/CEO Robert H. Schaefer said his goal is to create a program that suits the needs of the county's second largest industry. The hospitality program differs from the vocational college's other programs, as many students will likely have work experience in their fields, hoping to advance their careers through specific coursework on management training or menu marketing. So while students can enroll for the full 34 weeks, they can also take individual courses such as managerial accounting, front office management or human resources management and supervision to advance their careers. "The possibilities of making a career out of hospitality are huge," said Schaefer. "We're talking about hotels and lodging, fine dining, spas, wine tasting rooms, the whole gamut." The privately owned college, which can accommodate an enrollment of 150 students, already offers courses in computer technology, medical assisting and other fields. The program is based on National Restaurant Association Education Foundation's Managefirst Program and American Hospitality and Lodging Association curriculum. The cost is $10,500, including books and supplies. George Kaplanis, general manager of the Hilton Garden Inn in Monterey, said the addition of training programs for hospitality professionals comes as welcome news. "I think it's wonderful that it's happening because there is a need," said Kaplanis. "Absolutely, we want trained people." The county's tourism industry competes against San Francisco, Napa and Sonoma, said Kaplanis, and the competition extends beyond just the tourists: Local hotels face stiff competition for employees as well from those regions, and the addition of a new hotel on Cannery Row will only tighten the competition. So anything that increases the size and depth of the work force helps Monterey County compete, he said. He suspects the industry, as a whole, would likely welcome interns and employees from Central Coast College with open arms. The area's high cost of living makes it challenging to attract midlevel employees from outside of the area, so Kaplanis said companies often find it preferable to promote from existing staff, using mentoring and training to prepare their employees for advancement. 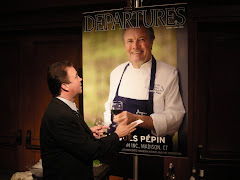 The sad departure, after 21 decadent years, of the Masters of Food and Wine at Highlands Inn left a local void in high-end culinary events. Enter Pebble Beach Co. and the dynamic duo of Robert Weakley and David Bernahl, local food and wine enthusiasts with rich and varied backgrounds. Weakley is the former food and beverage director for the Park Hyatt Highlands Inn and pulled all the strings behind the last few Masters events. Bernahl is founder, president and CEO of Pacific Tweed in Carmel and self-professed gourmet and connoisseur of wine. 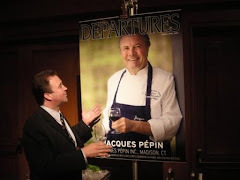 The men were not content to just let the Masters of Food of Wine leave without planning their own event, now simply called The Pebble Beach Food and Wine Event (come on, folks, we're a bit more creative than that — let's come up with a better name). Pebble Beach Co. has announced its intention to host the event, planned for March 2008. The four-day spectacle will attract more than 2,000 attendees to the piqueresque Del Monte Forest and will feature an estimated 125 wineries and 25 celebrity chefs. The long weekend will include wine tastings, cooking demonstrations, a rare wine auction and, of course, some exclusive and unique dining experiences. The events will be spread throughout the property, using facilities at The Inn at Spanish Bay, The Lodge at Pebble Beach, Casa Palermo, The Beach and Tennis Club and the Pebble Beach Golf Links. A press release from Pebble Beach reported the following: "(The event) will host several exquisite culinary events and activities that will exceed the expectations of the most discerning palette (we hope they mean "palate," although food can indeed be art). Multi-flight vertical and horizontal wine tastings from the world's cult producers as well as thematic lunches and dinners prepared daily by top celebrity chefs will be available for guests to enjoy." Part of the proceeds from the event will be given to local charities and to help create culinary and enological scholarships. 2 lbs broccoli broken into florets and sliced in half. Mix together soy sauce, pepper , sesame oil, and corn starch. Add beef coat well and let marinate overnight. Heat peanut oil until smoke begins to rise. add broccoli florets and salt, stir well. Add water, cover and cook on high for 3-4 minutes or until steam begins to escape. Remove broccoli and any liquid to a plate. Add remainder of peanut oil. Add garlic and brown for 1 minute stirring often. 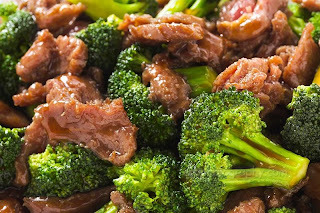 Add sliced beef and stir-fry until the color of the meat changes, about 1 minute. Return broccoli and stir fry for 1 minute. Mix ingredients together and marinate several hours or overnight. Stir fry diced chicken until cooked through and nicely browned, remove to separate bowl. Stir fry green onions, zucchini, red peppers, ginger, and garlic about 30 seconds or so. Remove to seperate bowl. Add sauce to pan until heated. Add Chicken to sauce and coat well. Add peanuts adn stir well. Finally add veggies and heat through. A more than 20-kilo (41-lb) mushroom has been picked in a forest in Mexico's southernmost state of Chiapas, university officials said Tuesday. 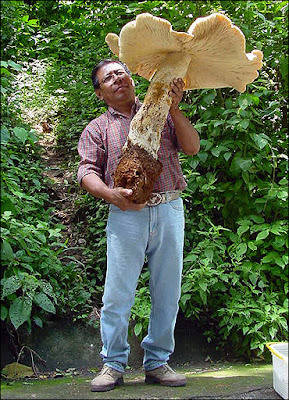 The white mushroom, macrocybe titans, measured a towering 70 cm (27 in) tall, was found near Tapachula, near the Guatemalan border, according to the Southern Border University Center. BEIJING (AP) - China on Tuesday executed the former head of its food and drug watchdog who had become a symbol of the country's wide-ranging problems on product safety. Zheng Xiaoyu's execution was confirmed by state television and the official Xinhua News Agency. "The few corrupt officials of the (State Food and Drug Administration) are the shame of the whole system and their scandals have revealed some very serious problems," SFDA spokeswoman Yan Jiangyang said at a news conference held to highlight efforts to improve China's track record on food and drug safety. Zheng's death sentence was unusually heavy even for China, believed to carry out more court-ordered executions than all other nations combined, and likely indicates the leadership's determination to confront the country's dire product safety record. Chinese officials already have said the country faces social unrest and a further tarnished image abroad unless it improves the quality and safety of its food and medicine. The industry regulator, the State Food and Drug Administration, has announced a series of measures to tighten safety controls and closed factories where illegal chemicals or other problems were found. Fears abroad over Chinese-made products were sparked last year by the deaths of dozens of people in Panama who took medicine contaminated with diethylene glycol imported from China. It was passed off as harmless glycerin. Chinese-made toothpaste also has been banned in a handful of countries due to its content of diethylene glycol. However, there have been no reports of health problems stemming from the product. China has no guideline banning the chemical in toothpaste, and the government says it is harmless in small amounts. The list of food scares within China over the past year includes drug-tainted fish, banned Sudan dye used to color egg yolks red, and pork tainted with clenbuterol, a banned feed additive. China also has stepped up its inspections of imported products and said some U.S. products are not safe. In the latest case, the official Xinhua News Agency reported Tuesday that a shipment of sugar-free drink mix from the United States had been rejected for having too much red dye. Last week, China's food safety watchdog said almost 20 percent of products made for consumption within China were found to be substandard in the first half of 2007. Canned and preserved fruit and dried fish were the most problematic, primarily because of excessive bacteria and additives, the agency said. New York commercial and institutional foodservice operations have reported higher costs and difficulty maintaining the crispness of some products as a result of the recently enacted trans fat ban, according to The Wall Street Journal. Foodservice operators are required to use oils for frying and fast for spreading that contain less than a half gram of trans fat per servicing. Next year, they will be required to remove trans fats from baked goods and frozen foods. MIAMI (AP) - Burger King said Friday it will use trans-fat-free cooking oil at all its U.S. restaurants by the end of next year, following in the footsteps of other leading fast-food restaurants. The world's second largest hamburger chain said it was already using zero trans-fat oil in hundreds of its more than 7,100 U.S. restaurants nationwide. Burger King is known for its flame-broiled burgers, but uses cooking oil for its french fries and most of its chicken products. In tests, consumers determined that more than a dozen items cooked in the new oil, such as french fries and hash browns, tasted the same or better than products cooked in the trans-fat oil, the company said. Miami-based Burger King Corp. said two trans-fat-free oil blends passed tests. If adequate supply becomes available, the U.S. rollout of the oils could be completed sooner than 2008, the company said. Trans fats are listed on food labels as partially hydrogenated vegetable oil. They can raise bad cholesterol and lower healthy cholesterol, increasing the risk of heart disease, doctors say. Critics have said Burger King was taking too long to move toward the healthier oils. The Washington-based Center for Science in the Public Interest sued Burger King in May, saying the company was moving too slowly and had failed to set a definite timetable for removal of trans fats. In response to the lawsuit, Burger King said in May it expected to begin the national rollout its new zero trans-fat oil by the end of this year. Among Burger King's main competitors, McDonald's Corp. (MCD) said earlier this year it had selected a new trans-fat-free oil. Wendy's International Inc. (WEN) started using cooking oil with zero grams of trans fat in August 2006. Starbucks Corp. (SBUX) announced in May that it will cut artificial trans fats out of food and drinks in its stores in the continental United States, Alaska and Canada by the end of the year. Yum Brands Inc. (YUM) said in April that all of its KFC restaurants are now serving fried chicken with zero grams of trans fats. Yum Brands also said its Taco Bell restaurants switched to a trans fat-free frying oil. Syntroleum Corp. said it signed a contact to deliver 500 gallons of synthetic jet fuel to the Department of Defense made entirely from fats supplied by Springdale, Ark.-based Tyson Foods Inc. Syntroleum will provide the renewable fuel for DoD to evaluate as part of a larger program aimed at long-term prospects for manufacturing synthetic aviation fuels.The U.S. Air Force wants to source 50 percent of its fuel needs from domestic alternative sources by 2016, and plans to certify its entire fleet of aircraft for alternative fuel use by 2010, Syntroleum said in a statement. The DoD contract follows Syntroleum's agreement with Tyson to set up a $150 million plant to produce fuel from animal fat. Credited most recently to have been developed by the research teams of University of Nebraska and the University of Florida, the flat iron steak has been gaining in popularity with restaurants across the United States. You can thank the National Cattlemen’s Beef Association for funding research to make this tasty, tender economical steak better known, along with the Chuck Tender, and shoulder Clod “heart”. The beef cut is actually a top blade steak derived from the tender top blade roast. The roast is separated into two pieces by cutting horizontally through the center to remove the heavy connective tissue. It was named after an old style of iron called..yes the "Flat Iron", because it is similar in shape. One of my favorite meat markets (other than Diablo Foods where I spent 8 years behind the counter, so I may be biased) was Petrini’s in Walnut Creek. I never had the opportunity to work there although I wish I had. In the same way a Chef reviews other menus and eats at other’s restaurants, I used to wonder in front of the meat counter and marvel at the different cuts that they offered. I remember seeing cuts of meat cut in ways that I barely recognized, where they using the same cattle that we were? 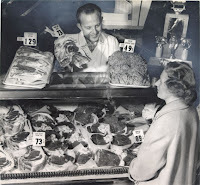 Petrini's markets were known as being the very best markets in the North California region for gourmet meats and food. 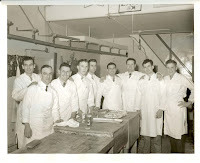 The butchers were well trained and very well taken care of by the business. The founder of the market, Frank Petrini, considered each of the market's employees as family, and encouraged the employees to treat each other as such. Mickey Petrini behind the Meatcounter. He greeted customers he knew personally, which were most regular customers, with a hug and kiss. 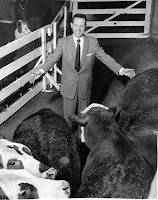 Frank Petrini carefully selected the cows that were to be slaughtered for sale in his markets himself, and rejected a majority of the bovine that were used for prime meat by other markets. Petrini's markets was the first large grocery store chain to specialize in quality gourmet food, and Frank Petrini thus created model that has been followed since by grocers both in the United States as well as in Japan, Australia and Europe. Some of the best selections of wine, coffee beans and European food in the San Francisco area were also found at Petrini's. Petrini's market was established by Frank Petrini, an Italian immigrant butcher from Lammari, Lucca. Frank Petrini 3rd from the left. He began working at age 12 in Italy, and was trained to be a butcher at age 14. He traveled to the United States alone in 1922, being the first in his family to come. He came directly to San Francisco with $5 in his pocket and started immediately working as a butcher from 6am to 7pm every day. He originally wanted to go to college, but with the advice of a priest, who was the director of the English school he attended, he concentrated on becoming the best butcher in San Francisco. Meanwhile, melt 2 tablespoons of butter in a heavy large saucepan over medium-high heat. Add the onions and sauté until tender, about 5 minutes. Season with salt. Add the garlic and oregano and sauté until fragrant, about 30 seconds. Stir in the tomato paste and cook for 2 minutes, stirring constantly. Whisk in the wine. Simmer until the sauce reduces by half, stirring occasionally, about 10 minutes. Remove the skillet from the heat. Strain the sauce into a small bowl, pressing on the solids to extract as much liquid as possible. Discard the solids in the strainer and return the sauce to the saucepan and bring back to a slow simmer. Cut the remaining 4 tablespoons of butter into small 1/2-inch chunks and whisk in the sauce a little at a time. Season the sauce, to taste, with salt and pepper. Mix all ingredients thoroughly and marinate steak for one hour. Grill over hotcoals 4 minutes per side. This steak is best cooked rare to medium rare. Retail prices for beer at supermarkets and other stores were up 3% in May from a year earlier, the biggest increase in 2½ years, according to the latest data from the Labor Department. That's higher than the inflation rate for the overall economy, and a bigger gain than in prices of liquor and wine bought to be consumed at home. Those going out will also pay more for beer. Prices for beer poured away from home were up 3.8% in May from a year earlier. The gains are in part a result of rising costs for malting barley, one of the main ingredients in beer. But a variety of other costs are increasing for brewers, including for other grains, glass, cardboard, energy, transportation, insurance and labor. "Across the board, we're facing significant price increases," says Martin Kelly, president and CEO of Magic Hat, a brewery in South Burlington, Vt., that produces beer sold in 17 states and Washington, D.C. Even the cost of the six-pack containers that hold the bottles have increased in price, he says. Kelly says a major price increase has come from malt made from barley. Malt costs have risen 9% in the past year, he says. Nationwide, average barley prices have risen 17% since the beginning of the year to the highest in 11 years. The increase is partly because farmers are devoting less acreage to the grain in favor of more lucrative crops, especially corn. Prices for corn have jumped in response to strong demand for the grain to produce ethanol, a fuel alternative blended with gasoline. For about 15 years, Louis Arnold, 71, planted 600 acres of barley on his farm in Esmond, N.D. But for the past two years, he has planted only 300 acres of the grain, devoting more land to corn and soybeans on his 3,500-acre farm. Not only are potential profits higher for corn and soybeans, but he has been plagued by a variety of barley diseases. "Barley is fifth fiddle right now," says Arnold, who is chairman of the North Dakota Barley Council. Farmers planted the third-smallest barley crop this year even though they increased acreage from 2006. Corn plantings, meanwhile, are up 19% this year to the highest since 1944, the U.S. Department of Agriculture said Friday. Barley has also become more expensive because now that more corn is being sold to make ethanol, there is less corn available to be fed to animals. That is leading to greater demand for other feed grains, including barley, for livestock. Barley "prices are going up right along with corn and wheat," says Tom Jackson, agricultural economist at consulting firm Global Insight. Brewers use a variety of grains in beer production, including rice, wheat and corn. Prices for all those grains have risen. Relief is unlikely to come soon as grain prices are anticipated to continue to rise in response to strong demand for corn to produce ethanol. "It's on an upward trend," Wells Fargo agricultural economist Michael Swanson says. There also have been "dramatic increases in virtually every commodity and other (production costs) related to making beer in the past few years," Coors Brewing (TAP) spokeswoman Aimee Valdez says. Coors contracts with farmers who grow a proprietary barley developed by the brewer, so it does not see as much swing in barley costs, Valdez says. But other costs, such as for aluminum, energy, paper, freight and labor, have all risen. Coors has raised prices less than 2% in 2006 and again in 2007. Jean-François van Boxmeer, CEO of Amsterdam-based Heineken, told analysts in February that his company expects costs for inputs such as raw materials, energy, transportation and packaging to rise 7% to 8% in 2007. The higher costs are coming as brewers are better able to raise prices to at least partially offset the increases. Heineken, for example, raised prices 2.5% on average in the USA in February after years "of a rather difficult pricing environment," van Boxmeer said. For companies, the greater pricing power is a welcome relief after beer prices declined in the 1990s, JPMorgan beverage analyst John Faucher notes. Since then, there has been an increase in the population of eligible drinkers, and consumers have shown a growing appetite for microbrews and imports. "You have had a massive shift up in what consumers are willing to pay for beer," Faucher says. But many companies, such as Coors, say higher prices aren't fully covering their increased costs. The competition is just too fierce to raise prices too much. Magic Hat has raised prices on average less than 2% in the first five months of 2007 compared with the same period in 2006, helping to offset some of the higher costs. Higher sales have also helped to maintain profits — the brewer has seen sales rise 30% on average in the past three years, and sales are on track to see similar gains this year. "For ourselves, and I would suspect for some of the other craft breweries, the biggest benefit we have is that sales are pretty good right now," Kelly says. U.S. adults age 21 and older on average drank more than 30 gallons of beer in all of 2006, up slightly from 2005. Americans drink more beer on the Fourth of July than on any other day during the year, according to the Beer Institute. American beer drinkers have plenty of company as beer prices are rising worldwide. Organizers of Oktoberfest in Munich, Germany, for example, warn that a liter, which is equivalent to nearly three 12-ounce cans of beer, will cost as much as $10.90 this year, up from $9.47 to $10.22. "The whole industry has pressure," Heineken's van Boxmeer said. Lately I have been stuck in a rut. It’s nothing too bad, but the allure of burgers and french fries have been sucking me in and I haven’t been putting up too much of a fight. So it is time to class it up a bit and rub elbows with the more refined palettes, to look at menus in Italian and French and wonder how they say “french fries” in those languages (it is “pommes frites” and “patate fritte,” in case you were wondering). But I have a feeling that my eyes won’t be looking for those trigger words this time around, because from what I hear this place leaves nothing to be desired. I am in Carmel and I just sat down at da Giovanni on Lincoln Lane, not far from the busy tourist strip of Ocean Avenue but in a world all its own. This is something I have missed while on my recent string of burger joints — not that those places are not hospitable, every one has had good service, but at da Giovanni it is hospitality at its finest. Here the servers’ first instincts are not to get you ordering but to put you at ease, to discuss the menu or anything you might be transitioning from at that moment. I file in with the rest of the crowd coming in from a day in Carmel, and even though the restaurant has a wine list as long as my arm, I have to pass (but a number of da Giovanni’s private reserve labels are calling my name). I need all of my wits about me if I am to get out of these woods tonight. The owner, Firok Shield, works the room and stops by my table to answer a few questions. With all the good things on this menu, it would be good to get a little advice on where to begin. And he is not kidding; you see those plates of cannelloni at just about every table. But the good stuff here is not limited to the cannelloni. There are many good ways to start at da Giovanni, but this is one of the rare places that always has carpaccio on the menu. It’s thinly sliced filet mignon, drizzled with extra virgin olive oil and freshly shaved parmigiano reggiano. Add a few drops of lemon juice and you have the beginning of a beautiful meal. Next I decide to try the linguine de Sardinia, with jumbo tiger prawns sautéed in southern Mediterranean spices. Those fresh prawns leave me with no regrets, but I can’t help but look with longing eyes at my neighbor’s crab and smoked salmon ravioli, served in a champagne cream sauce with shallots and topped with baby scallops. It’s hard to look at that plate and not want a taste. But it’s now time for the decision of the main entrée, and the Chilean sea bass is calling my name. So is the rack of lamb. The Nathan's Famous Hot Dog Eating Contest championship belt is back on American soil. In a Fourth of July performance for the ages, Joey Chestnut has defeated six-time defending champion Takeru Kobayashi. Kobayashi took second place with 63 dogs, which shattered the previous world record ... except that Chestnut, eating right next to him, ate 66 dogs. Kobayashi appeared to vomit at the very end of the competition(see video), which would have been a disqualification, but the judges apparently allowed his total of 63 to stand. The story of the contest beforehand was Kobayashi's arthritic jaw, but that was a non-factor. Kobayashi had the best performance of his career, but Chestnut was just a little bit better. People often think of winery chefs as upscale cooks who prepare lunches and dinners for small groups of wine aficionados. But Jerry Regester, executive chef at Wente Vineyards in Livermore, might whip up a four-course dinner for 320 summer concertgoers the same night he dishes up a concert buffet meal for 1,300. So much for the small group of wine aficionados. Regester has cooked at large and high-end dining rooms -- Highlands Inn in Carmel, Ventana Inn in Big Sur, Domaine Chandon in Yountville -- but he admits that starting the job at Wente just 10 days before the beginning of the winery's concert season last year was a bit daunting. At the same time, the job is tailor-made for this chef, whose credo is local, local, local. The winery has its own organic garden that yields herbs, peppers, tomatoes, chard, squashes and, until a couple of weeks ago, pea shoots. Wente even harvests honey from its own hives. What doesn't come directly from the property, Regester generally buys from Northern California farms. One of his favorites, melons, are hitting their peak in time for the Fourth of July and for the debut of his summer menu. T&D Willey farms of Madera supplied him with Orange Sherbet melons last year (they were fantastic -- sweet, juicy, voluptuous, he says), but he can't get them this year. Instead, he'll use Charentais from Riverdog Farm in Guinda (Yolo County). Musk melons would also work in his favorite presentation, which is a first-course salad rather than a dessert. Diners love the surprise factor, the chef contends. It adds excitement to the dining-out experience. His recipe for this salad is fairly open-ended. Frisee and watercress will probably be the greens in the mixture in the next few weeks. But he might substitute arugula if it looks better. Constants are the vanilla bean vinaigrette, another slight surprise, and candied walnuts and perky grapes. Regester arranges these ingredients over attractive peeled melon wedges, letting the juxtaposition of sweet fruit, bitter greens and crunchy nuts and grapes play against the aromatic acidity of the dressing. Before melon season went into high gear, he used peaches in essentially the same salad. And in the dead of winter, when variety shrinks even in California, he gives a similar treatment to yellow sweet potatoes. Like most Americans, Regester, who grew up in upstate New York, always associated sweet potatoes with Thanksgiving. Finding them in a salad, he says, wakes up the taste buds -- just like the sweet melons of summer. The Restaurant at Wente Vineyards, 5050 Arroyo Road (near Concannon Boulevard), Livermore; (925) 456-2450. Lunch and dinner daily, brunch Sunday.